RapReviews.com Feature for May 25, 2010 - Reflection Eternal's "Revolutions Per Minute"
is at 40 billion a year, they rakin in record profits - stop it! How they bankin while the auto industry is tankin? 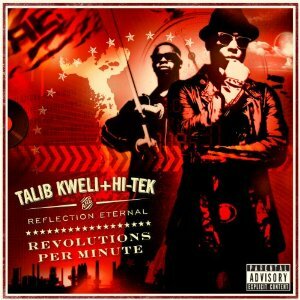 The desert where the blood and oil spill..."
A decade ago Talib Kweli and Hi-Tek decided to take the world on a "Train of Thought." While the name Reflection Eternal already resonated through hip-hop thanks to the underground juggernaut that was Rawkus Records back then, releasing a full length album took it to a level even fans of Talib as a rapper or Hi-Tek as a producer couldn't possibly have imagined. Looking back on the review a decade later and a lot more jaded about the music industry, the enthusiasm shown for Talib Kweli's work seems almost TOO effusive - a level of praise that seems more personal than professional. And yet listening to "Revolutions Per Minute" I find myself falling into that same trap all over again, because as he has said so many times himself you can't spell "quality" without Kweli. Self-promotional as that punchline may be it rings true when listening to him rap over Hi-Tek beats. Quality. Quality in every beat. Quality in every rhyme. Quality in every topic and quality in the words of wisdom spoken ABOUT said topic. It stares you in the face regardless if you try to look away, and if you make eye contact for even a second you're transfixed by the beauty of what you now behold. Quality. Take "Ballad of the Black Gold" for example, which I quoted from the open the review. It's a bit ironic to use a beautiful sample from "Let Me Back In" by Heaven & Earth as the musical backdrop, but it makes the words Talib speaks that much more poignant and painful. While most emcees would shy away from topics like these, Kweli is using his keen powers of observation to see the world for what it really is, and then translate that knowledge into a musical form you can simultaneously enjoy and learn from. Even if you've heard the phrase "blood for oil" before when discussing the Middle East, few people have been able to sum it up as concisely and as powerfully as Talib Kweli does here in OR outside of a rap song. While some would argue that "going oil free" is unrealistic and possibly even naive, one has only to look at the millions of gallons of crude spewing into the Gulf of Mexico for the last month to realize just how much our dependance on oil costs us. While undoubtedly coincidental given the album was recorded long before BP's drilling platform exploded, the truth would be relevant either way - it's just more self-evident now. In fact, all of the people who have died in pursuit of "black gold" without going to war in Iraq or Kuwait are part of the unseen "blood for oil" trade we make every day - 11 people lost their lives in that BP explosion without a single shot fired. Now before we get too far down a geopolitical road, I know some of you are thinking "Great - Talib Kweli is going to preach to me for 17 tracks about how fucked up the world/the United States/the economy is - I don't want to hear it." Good news - Talib has been rapping for over a decade and he knows how to walk the fine line between being entertaining and being preachy and didactic. His only real flaw in his early days was one I shared reviewing the first Reflection Eternal project - over-enthusiasm. Talib was drunk off of his lyrical ability to the point he'd cram too many words into a bar, challenging his breath control far beyond what was necessary and occasionally making his delivery sloppy in an attempt to keep up with the beat. As the years have gone by his flow has matured and settled down to the point he choses fewer words but uses the fluctuations of his golden vocal tones along with subtle emphasis on specific phrases to achieve greater effect. He's also embraced the time-honored Boogie Down Productions philosophy that you can't move the masses if you don't also move their asses, so songs like "Just Begun" have as much funk and swagger as you could ask for. Look in the scope, my people still a target"
These wack emcees make me laugh like Comedy Central"
I spent a full week listening to "Revolutions Per Minute" from start to finish to make sure I wasn't spouting needlessly effusive praise by the time I wrote this review - and honestly my opinion hasn't changed one bit. This album is great. The only criticism I could offer, if it could even be called that, is that these revolutions aren't really so revolutionary any more - Talib's a seasoned veteran of the rap game as opposed to the young upstart he was a decade ago. That said there's something magical about pairing him with Hi-Tek on production that transcends his already almost unlimited lyrical potential and creates an extraordinary experience. Some rappers and producers just have it like that - Pete Rock and C.L. Smooth, Gift of Gab and Chief Xcel, Primo and Guru (R.I.P.) the list goes on. Talib Kweli and Hi-Tek is one of those combinations no hip-hop fan can or SHOULD resist. This is an album not to be missed.